We've always seemed to have a pet (or 2 or 3). Our first pet was a cat named Sudsy (she was found in a laundromat). After she passed away, we had another cat called Nicky. We gave her away when we moved to Ontario. Our Ontario rental home was mouse infested, so we obtained a male kitten called Tiger. He soon cleared the house of mice. After Tiger came Muffy, Callie, Tara (the dog), Blackie (Socks), Whitey (Clowney), Ollie, Rusty, Fluffy, Rufus and Dufus. 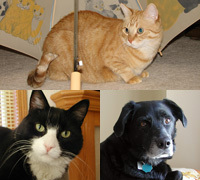 Of this mangerie, we currently still have Rusty, Fluffy, Rufus and Dufus. Of course, we've also had the usual collection of exotic freshwater fish and two hamsters. However, these smaller pets have long since gone. If you wish to see more detail on any of our recent pets, just click on the pet's name in the green sidebar to the left. Several of our animals have been obtained from the local Humane Society. It is a great organization and well worth supporting. Marj has volunteered with the Humane Society over the years, mainly in the cat adoption area. We have also fostered many batches of kittens, getting them healthy, socialized and old enough to adopt.